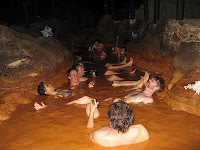 I love Japanese onsens. I love the relaxing water, the pleasant designs of the tubs, and the views they often overlook--even the smell of sulfur has grown on me. In fact, the only thing about onsens that I don't enjoy is the whole getting naked with a bunch of other guys part. One way to get around this dilemma is to choose hotels and ryokan that offer 貸切温泉 (kashikiri onsen), also known as 貸切風呂 (kashikiri furo). These are private bathing accommodations that use the same hot spring water, but in a smaller tub suitable for an individual, couple, or small family to use in private during a reserved timeframe. Kashikiri, or "reserved for private use", may bring to mind images of luxurious, expensive hotels and resorts, but that's not always the case. You can find such private bathing accommodations at cheaper hotels and ryokan as well. * It just depends on whether the hotel offers an onsen and whether those facilities have been split up into smaller, walled-off bathing areas that can be reserved for individual use. Hotels that do offer 貸切温泉 or 貸切風呂 will usually allow their overnight guests to reserve an hour's use at no additional charge. Except, what is up with all these towels? Another term for these private onsen, particularly when the facility doesn't have an attached hotel (and therefore caters only to day patrons), is 家族風呂 (kazoku buro) or "family bath." Cost of using one of these family baths will include the cost for using the facility (入浴料, nyuuyokuryou, usually 300-500 yen) with an additional fee for reserving the private room (in my experience, usually 1000 yen for an hour). When searching for rooms on hotel sites like Jalan or Rakuten, there is often a checkbox under advanced search options that will limit results to hotels featuring 貸切風呂 (also often called 貸切露天風呂, kashikiri rotenburo, which just means that the private bath is also open-air). Another site I like to use when traveling is Kashikiri-Onsen.com, which though very Web 1.0, gives a nice map of Japan by region, with little dots representing hotels noted as having private bathing accommodations. The map is great for helping you visualize how close the hotel is to other points of interest on your vacations, as more than a few of the hotels and ryokan that specialize in private, open-air baths are remote from major city centers. how is sexuality involved? weaboo. Q&A: When is it OK to Laugh?